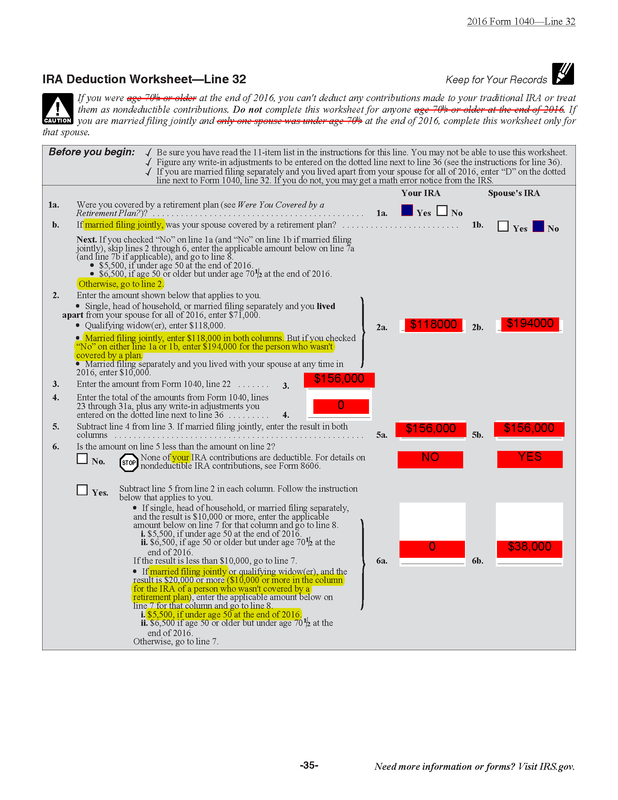 I'm trying to understand the questions in this vectorized case of Married filing jointly for the IRA Deduction worksheet. In my case I work and contribute to a 401k, my wife does not so for Question 1 I answer Yes and No respectively. For the sake of constructing an example where the condition to follow in Line 6 is different for both spouses I filled in line 3 with the average of the two figures (118+194)/2=156, which is distributed identically for line 5. Come Line 6 it asks if the amount on Line 5 > Line 2, which for me would be No, for my wife Yes. It then says No. STOP None of your IRA contributions are deductible. What exactly does this mean in the context of filing jointly? Is it a question applicable to Husband and Wife individually or together, meaning if either one has No then the joint filing cannot take the deduction, or is it instead speaking to the fact that we may both individually have IRA accounts and contributing to each but only one of the spouses in this context can claim the deduction while the other cannot? What if the IRA is a joint account? Does the account with deductible contribution have to be under the person's name who did not have a 401k? In other words it would not be sufficient for me to have the account in my name with my wife as 100% beneficiary, the account would have to be in her name end of story. You do not qualify to deduct IRA contributions because you are married, filing jointly and you make more than 118k. Source: IRS. This does not mean you cannot or should not contribute, it just means that you do not decrease your tax bill when you contribute. Roth IRAs still have tax benefits on the distribution end. Well, my not knowing that by definition an IRA cannot be a joint account has led me to my confusion in interpreting the above question. So now I can rightly grasp that this worksheet in the context of married filing jointly addresses these questions to both spouses individually. Interesting stuff. An individual retirement account (IRA) must be established and maintained on an individual basis. It cannot be held jointly. So to wrap up the results of the remainder of the worksheet for this example, I would not be able to yield a tax deduction contribution to 1040 Line 32, but my wife would be able to up to a maximum of $5500. Cool beans. Not the answer you're looking for? Browse other questions tagged united-states tax-deduction form-1040 or ask your own question.